Samenvatting Personality Psychology Verplichte stof Extensive summary in English of the book Personality Psychology used for the course Theory of Personality. The important concepts are emphasized. Psychology of Personality - Summary This summary follows the structure of the book "Personality Psychology. Domains of knowledge about human nature" but also contains important information from the lectures, that wasn't included in the book. All chapters except for 9, 12 and 17 are covered (those weren't relevant for my exam). Summary - Psychology of Personality - All Chapters and all Lectures A complete summary of all mandatory chapters for the Psychology of Personality Course at the Tilburg University in the year 2018/2019. AO2 samenvatting Summary of all study material for AO2 including notes of the lectures and seminars. Summary of the book is in English, the rest in Dutch. 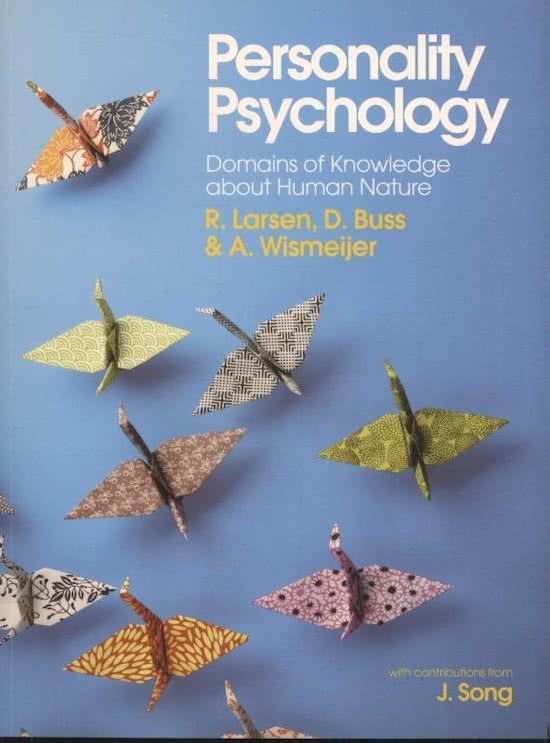 On this page you find summaries, notes, study guides and many more for the study book Personality Psychology, written by Randy J. Larsen & David M. Buss. The summaries are written by students themselves, which gives you the best possible insight into what is important to study about this book. Subjects like Personality Psychology, Persoonlijkheidsleer, psychology, Psychology of Personality, Personality, Persoonlijkheid, Persoonlijkheid en individuele verschillen & Persoonlijkheid en individuele verschillen samenvatting will be dealt with.